Karate Kid II (1986) has Mr. Miyagi (Pat Morita) and Daniel (Ralph Macchio) going to Okinawa and facing several conflicts there. I actually liked this movie a bit more than the original. And it has a young Tamlyn Tomita in her first acting role. The main theme song for the movie is Peter Cetera’s The Glory of Love. It is sort of like a traditional romantic ballad with some interesting twists in its composition. I submit it for your Sunday enjoyment and wish everyone a pleasant day. Runners are not shy about telling when things are not done right. The Titanic Half and 10K Marathon was anything but well received by those who ran it. Complaints were aplenty: not well marked route, the half marathon was not really a half marathon, no first aid stations for runners after the race, one ambulance for the race, and probably the worst was not enough portable toilets. An investigation has been launched by the governing body. 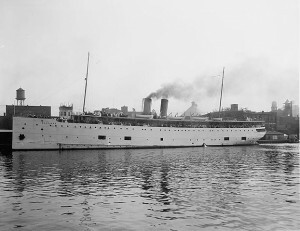 Many sons and daughters of the Emerald Isle left in the 1900’s and Titanic Experience in Cobh wants to hear their stories of travels on White Star ships. Cobh was a major departure point and their last look at Ireland as they sailed away usually forever. They are asking for relatives to share stories so they can be recorded. Local people are being asked to help as well with whatever they have as well. To submit a story or to obtain further information you can contact them via email at email stories@ titanicexperiencecobh.ie. They want to compile the stories for an exhibition in August. 3. Calling Columbo: Mystery Plaque Shows Up But Where Was It For So Many Years? A Titanic commemorative plaque given to Lord Pirrie in 1912 ended up in Spain and now with the Spanish Titanic Foundation. 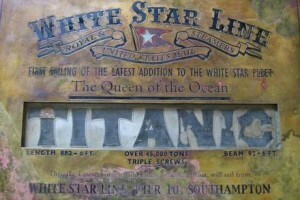 The plaque is inscribed Titanic below the moniker “Queen of the Ocean” along with ships departures date. The story is that a British man in need of cash sold it to an art dealer in Barcelona, Spain. 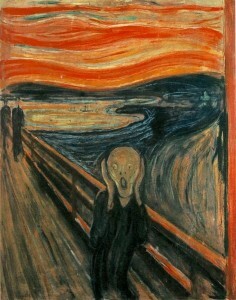 It was acquired by the dealer’s grandson who hung it in his home and recently loaned it to Spanish Titanic Foundation. The plaque had been in Pirrie’s office and then disappeared until 2003. All kinds of questions arise about its provenance as a result. One assumes they have authenticated it is the real plaque through forensic testing. There is also an open question as to how it came to be in the hands of some, as of yet unidentified, British citizen who decided to sell it for cash. Considering the popularity of Titanic, why was it sold to an art dealer in Barcelona when it could have commanded a much higher price at well known auction houses in the UK? Skeptics will wonder whether the reason is that the person selling it might have a hard time proving they had legal possession or that it might be a fake. The mystery continues. *Due to policy of demanding payment for links for Republic of Ireland newspapers, links are no longer provided. *The Mystery Box Challenge returns full of rice! As soon as our brave chefestants raise the box, a mountain of rice is revealed with a lot spilling on the floor. Getting them properly set up took a bit of stage magic (they are covered, turned over, a covering is pulled out, and you are ready to go) and of course we never see that they had to come in and clean it all up before they started cooking. *Playing to your strengths is the best option here. Christopher’s pineapple boat looked cool. Derrick was displeased when his name was not called. Instead it was Hetal for her Indian dish and once again proved vegetarians know how to cook. Claudia did a take on a Mexican dish that was quite tasty and well received. Tommy topped them all with his jambalaya that his aunt made in a cast iron pan. It got rave reviews and earned him the win. There was a cheeky moment when Gordon said he wanted to wake up with Tommy, which brought laughter, until he corrected himself that he wanted to wake up in the morning after such a wonderful meal. Good save Gordon! *Tommy has to decide which of the three food pairings to have his fellow cheftestants suffer through. The choices are peanut butter and jelly (Christina), ham and pineapple (Graham), and basil and tomato (Gordon). Tommy selects peanut butter and jelly, gets an automatic seat in the top ten, and gets to save two people. He can save one at the beginning and one at the end. He chooses Claudia but she declines because she wants to prove herself. Later she would tell Graham that if she failed it would haunt her. Fortunately that was not the case for her. *So what do you do with peanut butter and jelly? Well you have to be smart about it. Dessert or savory dish? Some choose dessert and others a savory dish. The two winners show how you can do it in different ways. Hetal choose cookies while Katrina made a peanut satay and spring rolls with ponzu. Claudia did an encrusted pork chop that also was a great dish. Christopher made a tart that he thought was going to be panned. Christina though showed how good it was and complimented him. It was a real boost to his morale. Several seasons back Dave Martinez won the Mystery Box Challenge and chose rice as the dish for the elimination. Then he did something amazingly stupid: he forgot the rice. He had to go begging from the other contestants. Though he got rice, the dish was panned especially by Joe. Shelly did not choose the ingredients but she knew the essentials were peanut butter and jelly. Oops. Big oops. So there she stands at her station with none of the core ingredients. Amazingly she manages to get them from others and proceeds to make spring rolls that visually are unappetizing and taste much worse. Sara, who is considered one of the top bakers on the show, botched it with her Peanut Butter and Jelly Tart with peanut butter pastry cream. The problem was that the peanut butter was folded into the pastry cream muting whatever flavor it might have added to the dish. To say Gordon was disappointed was an understatement. He pointed out it was the first dish he tasted that night in which did not taste peanut butter. She disagreed saying that to her it tasted like a peanut butter and jelly sandwich. Gordon roles his eyes at this and says there is no peanut butter in there. She says there is and Gordon dissects the dish and shows that hardly any peanut butter can be seen. It is possible she choose a very neutral peanut butter (one that is low in sugar and salt) that resulted in a diminished flavor profile. My guess is that she measured in too tiny an amount. The result was underwhelming. Graham is a bit less pointed but noted the tart shell was thick and undercooked that when you got the entire bite you did not get the peanut butter and jelly explosion in the mouth. Sara still defends by saying it was not bad. I think this is a case of both arrogance and complacency. She could not tell the defects because she believes her dishes are perfect. 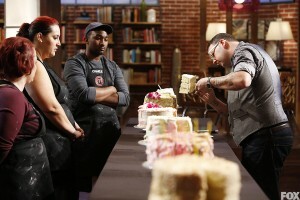 *Shelly and Sara face the chop but the judges think Shelly has more to learn. Sara gets the chop and heads home. Katrina-She really excelled in this episode and showed some real cooking chops with her peanut satay and spring rolls dish. So she moves up from the bottom right to the top. Hetal-Once again she showed her abilities both in the Mystery Box and Elimination challenges. She is really a serious contender for the top four and top two right now. Tommy-He really brought it with his jambalaya. He may be known for fashion designs, but may have a second career with a restaurant. And his jambalaya recipe gets him national attention in the September issue of Family Circle. Claudia-Anyone who can pull off a pork chop the way she did deserves being in the top tier. Christopher moves up from the wildcard position. He really made an impression with his tart. Olivia & Stephen-We assume since that since their dishes were not shown in the elimination challenge they were acceptable though not exceptional enough to warrant their inclusion in the broadcast. Derrick-He did nothing exceptional either in this episode. Shelly took a major tumble this week. She really needs to step it up fast or end up out the door sooner rather than later. This week the wildcard position goes to Nick. He choose the save so we will never know how his elimination dish would have fared. However if Tommy thought it looked bad, he was lucky to get the save. Next week: Cattle call. Literally. Our brave cheftestants will be feeding a hungry group of cattle herders (otherwise known as cowboys). Lots of field work there and challenges galore. Will Hetal be able to lead a team to victory when the main ingredient on the menu will be meat? Will Stephen finally loose his mind needing a quiet space to relax? *This episode was all about Gordon Ramsay. A few episodes ago we had a steak challenge in which he was the only judge. This episode was all about his famous Beef Wellington and scallop dish. Both are highly technical dishes and demonstrate who really is a cook or a chef at this point. *The Mystery Box challenge was replaced by the Beef Wellington challenge. They sat in pairs in the dining room to eat it (except Hetal, who could not eat it and had to rely on Christopher to tell her about it). Then they cooked the Wellingtons and the dining pairs became teams and selected one to be tasted. Hetal was the surprise since her Wellington was judged very good (Christopher wisely did not submit his-too big and not good on the inside Wellington). Also a surprise was Derrick ending up on the bottom with Kerry, Katrina, and Nick who had inferior specimens. *It became a Dreaded Pressure Test by having them all imitate a Ramsay scallop dish which he demonstrated. Katrina got flustered and was clearly out of her element but survived. So did Derrick. Nick did a great job and Gordon was clearly pleased. Sadly Kerry had timing issues and was missing many major components (he got the scallops done but mostly everything else never got on the plate despite being done). So Kerry got the chop and said adios. The promos for next episode indicate an early favorite could go but trick editing often can lead you astray. Rice is on the menu (lots of it that spills on the floor from the promos). And Gordon gets cheeky with Tommy. The most up-to-date examination of the Titanic wreck site using modern forensic technology to understand more clearly what happened. Instead of just looking at a few sections, this expedition sought to map the entire site and learn new details. Many well known Titanic experts were involved along with a lot of other experts as well. This is certainly the most ambitious expedition to date. Enjoy! The Swedish Chef likes to get around. Here he is at ESPN as their cook. Word of advice:do not ask for hamburger! 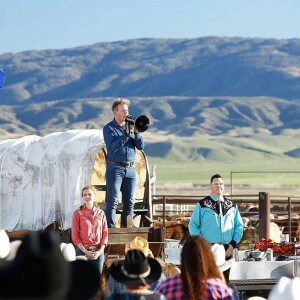 Masterchef US Season 6, Episode 8: Happy 100th Episode, Now Two Must Go! Being the 100th episode of Masterchef, a party is called for. Catering is expensive so they wrap it into an episode of where the cheftestants cook the appetizer and entrée. The winners move on but two will be chopped in the end. 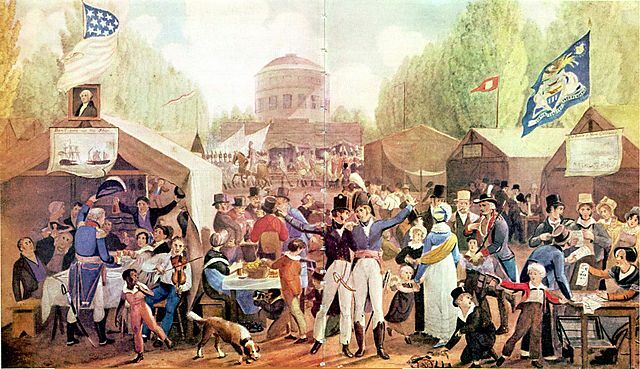 Both teams have to produce an appetizer with oysters and caviar, and an entrée with duck breast. Olivia goes for elegant and fussy which means complicated and time consuming. She wants smoked oysters but ignores Tommy’s warning about how to do that. Christopher does not do a test cook and winds up overcooking a lot of oysters which means not so many oysters to plate now. Their appetizer ends up being a salad and not well received by the judges. Derrick is agitating to get things better and Olivia starts losing it until Gordon gets her head straight. She takes command and the entrée is much better than the appetizer. They come out of the gate strong but falter on the entrée course. Nick does not keep his eyes on what others are doing so Charlie lets the carrots burn in the oven, duck breasts sits around too long and gets cold, and underdone duck shows up. Not a great day for Nick in the end. His team loses to Team Red and must face the dreaded pressure test. Team Blue learns one will be saved but they have to decide who will leave or face them all leaving the show. Masterchef does this to purposefully manufacture tension. Ultimately Stephen is saved but leaves lots of lingering tensions that will no doubt bubble up later in the show. For your consideration: a simple three-tier birthday cake. Sounds easy if you do not have a clock ticking down to your possible doom. Claudia has the most outstanding cake while Nick and Sara have okay cakes but good enough to save them. That leaves Amanda, Charlie, and Shelly on the bottom. In perhaps the weirdest way to make a cake, Charlie decides to create a short stack birthday cake. Except of course that makes it look not only weird but darn impossible to properly put the frosting and toppings on. It is a messy stack, so messy that when it was being made Christina had to turn away. In all the cakes ever presented on the show, it was the worst. It even makes Tommy’s famous worst cinnamon rolls in history shine by comparison. No matter how good it tasted, the presentation was so awful that no surprise he was sent home. 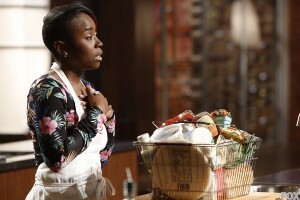 Amanda has shown real talent on this show and probably will run her own restaurant one day. She started out great making a cake she knows very well but she took the sponges out of the oven too soon. They literally fell apart on the plate and it was plain it was raw. The judges were aghast and she began losing it. At this point it is pretty obvious she is going home. There is no way the judges can overlook this technical violation. Gordon gets her to dress up the cake and make it presentable. To that I say what the heck? At this point there is no point in dragging this out any further. I would have said I am so sorry and ask for the apron. No need to make this any more painful. That is not what Gordon did though. He made her present the raw cake underneath the frosting. Then when it came down to decide between her and Shelly’s undercooked and muted flavor dish, they did something worse. Often on this show they will mislead a person to think they are safe when they are not or vice versa. So Gordon calls Shelly to take off her apron. She and Amanda hug with Amanda believing she is safe. And then Gordon drops the bomb telling Shelly to head upstairs leaving poor Amanda there to be sent home. This was cruel and unnecessary. It really makes me mad at Gordon and the producers for what they did. They head fake someone who clearly was on the road to go home to believe, just for a moment, that she was safe. Shame on them! And Gordon is the rear end of a donkey as far I am concerned. I have been concerned both on Masterchef Junior and this show that a certain level of meanness has crept into this show. And this demonstrates it. Get stuffed, Gordon.